We are engaged in offering Manual Hydraulic Machine. We are dealing in Manual hydrolic press. 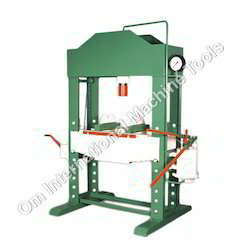 Heavy duty, steel fabricated body, hand operated type HYDRAULIC PRESS M/C., complete with all std. access. In order to cater the variegated demands of our precious clients, we are offering an excellent quality range of Hand Operated Hydraulic Straightening Machine.